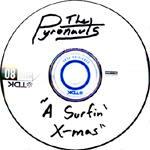 The Pyronauts take 13 holiday songs and transform them into surfin' Santa reverb celebrations. The sound is delicate, respectful, and traditional. the arrangements are sometimes very simple, yet very effective. many tracks are short, some under a minute. This is a very smooth and enjoyable salute to that new shortboard under your tree. This is a pure trad arrangement of this venerable Christmas classic. Beautifully played, with delicate damped verses and double picked power verses. The variations keep it fresh, and the surf sound brightens the arrangement. Ultra cool damped reverbed lead guitar give this a whole new sound. Smooth and reverent, surf, and cool. Quite nice. Trad sounds sweetly deliver "We Wish You A Merry X-mas" from the MOR graveyard into the woodie of your choice. Nice track. Delicate double picking gives this an Italian surf feel, while retaining the holiday spirit. Nicely arranged. This is an interesting choice, delicately played, melodically displayed, and reverbed as required. I can't think of another surf version. Soft spoken and cool. A bit of a Spanish surf feel transforms Bingo Crosbiano's syrupy classic into a soft surf gift wrapped tradition. Simple and very nicely done. "O Christmas Tree" is treated with military drums and almost classical guitar. It's short and very nice. This is a fine trad version of "Good King Wenceslas." It's so perfectly surf, it makes you wonder if the good king was a longboarder! Very short, but very cool indeed. It's amazing how easy it can be to convert antiquarian holiday slush into warm surf reverb. It's tracks like this that reinforce the extreme flexibility of the genre. Brief, but very satisfying. Often surfed up, from the Mermen to the Aquavelvets, this tune is a fine vehicle for this band's traditional sound. Nice interaction between twin lead guitars. Understated and most appealing. Almost a polka, "Away In The Manger" dribbles out double picked reverbed melody over playful percussion and solid bass. melodic and fluid, like December at Malibu. It closes with a surprise big ending. Soft and delicate, "Silent Night" floats out from a solo guitar quietly picked. But wait, there's more! Double picked guitar over rockin' bass and drums in a surf format, and then a quiet ending. Quite nice. Another of the often surfed classics, the Pyronauts make it shine as the two guitars counter each other and the bass floats. The drums are very interesting, dramatic and artful. One of the more interesting covers.